Have you ever been curious about how some one else's house looks? Or have you ever wished you could sneak inside to see how they live? Since I spend so much time in my kitchen and it seems to be the most popular family gathering spot, I thought I'd share a photo of my kitchen. Now, of course I have a long list of changes, upgrades, and "if I won the lottery" wish list. But for now ...my humble, little kitchen is just fine! Oh yeah, and if you want to see some more amazing home pics... check out Martha Stewart's. She has a section on her website where you can view 5 of her properties - Martha's Homes!! Beautiful kitchen! I love that section of Martha Stewart too! I had a kitchen that was a gathering spot but after years of saying, "move," or "excuse me," or "I have to get in that drawer you're leaning on," when we moved, I specifically looked for a galley kitchen that wasn't a thru-way. The eating area is at the end and that's the thru-way so people can still talk to me and sit there, but there's no reason to be in the cooking area where I'm working. Yours is lovely and light! your kitchen is gorgeous!!! I wish I had that kind of room! We did redo it according to our budget about 5 years ago, but there are some changes I would love to make! Coming from a kitchen design professional, it looks like a great space: convenient, well thought out, and cook-friendly. Love the angle sink under both windows and the glass tabletop butted next to the island. Do I see a walk-in pantry in the other corner? I love islands in a kitchen. Mine is counters lining the corner. and not even that much of space. Big walk from the sink to the fridge but its empty tiling between, no storage or countertop space. Thanks everyone! And yes, there I do have a walk-in pantry in the corner. It is one of my favorite rooms in our house! I like your cabinets. 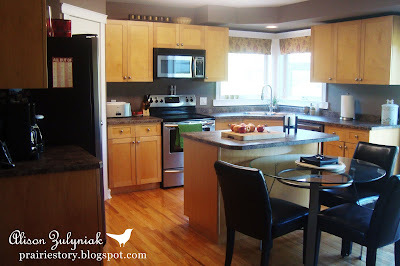 I posted my kitchen on the linky party @ a bowl full of lemons!